I'm out of my reviewing comfort zone again. The Raising is Not My Thing. I'm a genre person, obviously, so fancy books that fall under the heading of plain old "literature" have the potential to go over my head. And maybe that's what happened with The Raising. Maybe there was this whole other layer to it that rose above the "plot" and spoke about some fundamental aspect of humanity, like the way that piece of abstract art on the wall at the museum looks like some preschooler pasted strips of construction paper on a blank canvas, but actually represents the defiance of a totalitarian regime. Or something. IDK, I'm just a knuckle-dragging paranormal romance reader, and this book was long. It's not that it was boring, exactly. It started out compelling enough, and the writing throughout is lovely. The introductory chapter certainly had me hooked, with all its amazing atmosphere and almost cinematic quality that was very easy - and beautiful - to visualize. 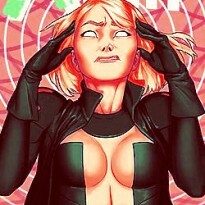 And the chapters following it were interesting enough, when you're actually reading them. The trouble was that when I put the book down, I wasn't all that eager to pick it back up. I had to talk myself into opening it again, because I realized that once you get past the initial introductory phase, the book goes nowhere, very, very slowly. The first, ohhhh, 250ish pages of this 360-page book are, for the most part, dedicated to two things: character development and setup. 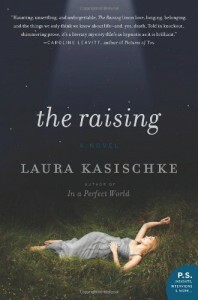 The Raising is told from the point of view of four different characters (the ones with the ALL CAPS names in the summary), and shifts between each of their daily lives on a Midwest college campus a few months after the "fatal" car crash that kicks off the novel. We see the two adult characters, Mira and Shelly, dealing with their jobs and stresses and their unsatisfying personal lives. Meanwhile, the two student characters, Craig and Perry, adjust to their worlds post-accident, and flashback to the halcyon days before it. And that's kinda it. To say the author takes her time building the plot would be an understatement - I had no idea what the core conflict would be, who or if there was an antagonist, or even what the nature of the damn book was (thriller? drama? supernatural?) until the last hundred pages. I could not have begun to sort out which dramas and side-characters in each protagonist's life were ultimately relevant to the overall plot, or if there was going to be an actual plot at all. For a while there, I considered that it was simply a slice-of-life look at the way one tragedy could affect four very different people. Perhaps there was no ultimate conflict that would bring them together. In retrospect, I wonder if that wouldn't have been better.